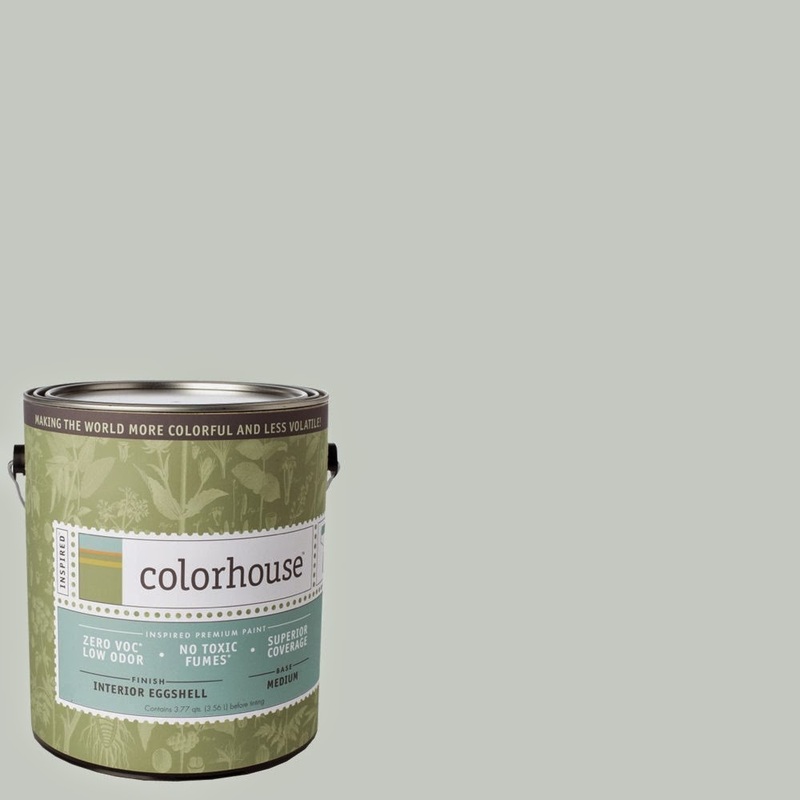 What do you think of this paint color in my house? (too many pictures) | House Unseen. Life Unscripted. Wait. Focus. It's a story about how 1) you should never trust paint colors online and 2) please help my brain think because it can't do it alone anymore. Nope. 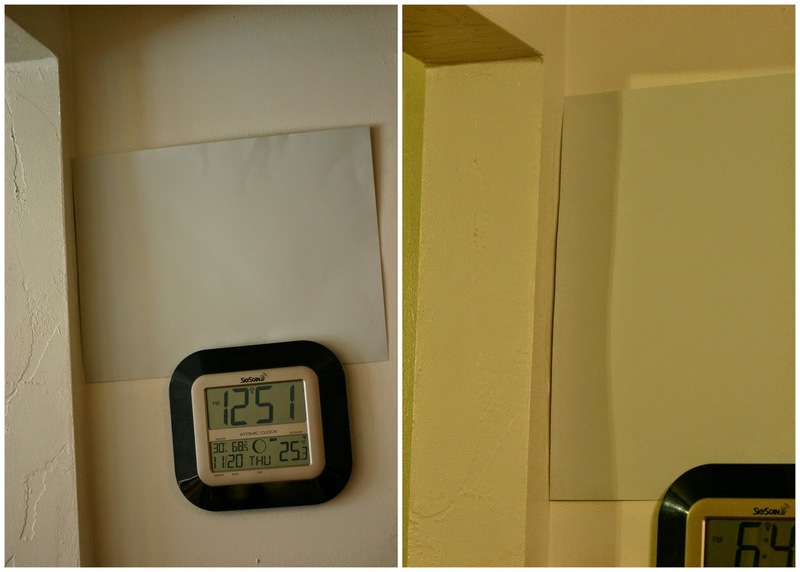 Top is daylight in the kitchen, bottom is evening in the living room. Same chip. Zoinks. That's where you come in! Because I need to think this out loud and you need to help me because you are the nicest. Muchas gracias en advance. So I was going for a cool, light grey that would complement the brick of the fireplace. This is bluer than I had originally planned, but I think I like it for this room. Pretty sure it's gonna look killer with the white trim and be nice with my precious gigantic red sofa. Apparently I'm a little obsessed with blue living rooms...? This is a south and west facing room, so colors are way more washed out in here. I feel like it'll be too sterile to have this color all over the place in here, but the current color has to go. Not good. It's just a tiny bit off and makes my skin look like I'm suffering from the stomach flue at all times. This is another room with a lot of natural light during the day and I feel like this color might not work in here because of that. Tell me what you think. All the trim in here will also be that same white from the first picture regardless of wall color choice. Oh my gosh y'all- this kitchen. This kitchen! Have I given you the full tour of this mess? I don't think I have. I'm gunning for a complete do-over once the old house closes, people. Wow. It is so, so bad. Like whoa, can you see the cabinets? And the yellow countertops? And the upside down, non-gfci outlet. Good times. 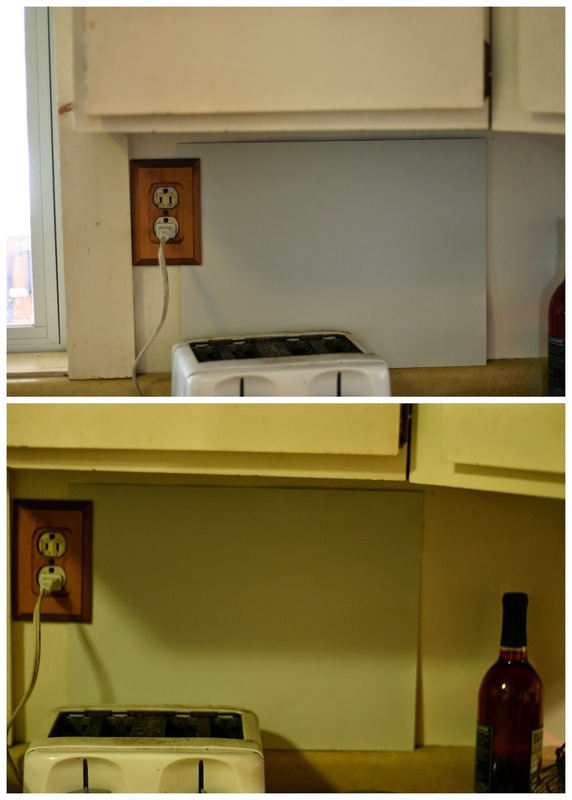 There are no cabinets or counters on either side of the fridge. 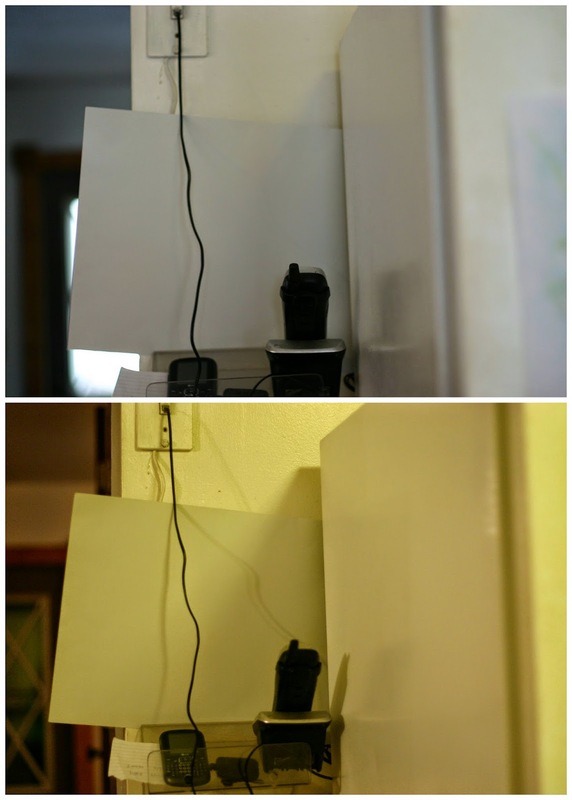 Just this plastic shelf screwed into the wall to balance your phone precariously upon. So wow. Much fancy. Yes, that is DUCK TAPE holding the countertop to the wall. Just...yeah. 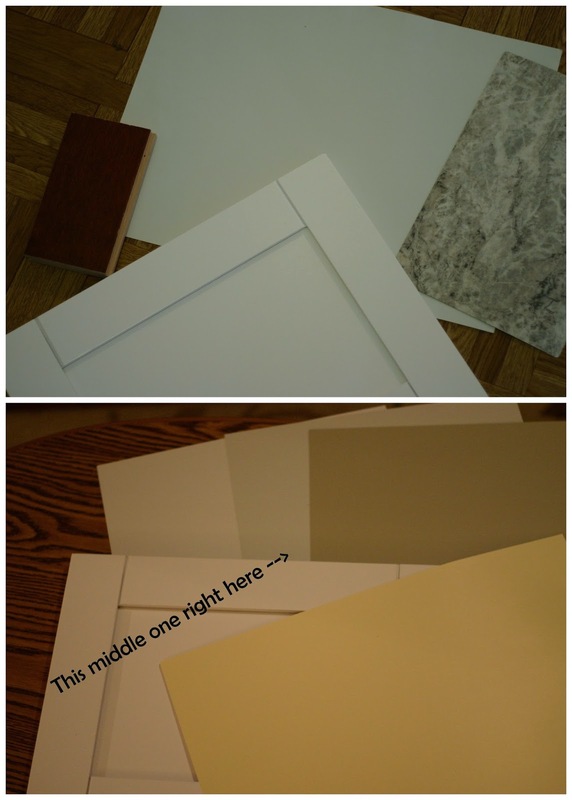 And here's the chip with the countertop sample, floor sample and cabinet door sample (which is the trim color, don't forget) on the floor of the kitchen during the day. Adjacent to the kitchen is the laundry room, which we're planning to paint the same yellow that we used in the old laundry room because I want to recreate as much of that magic as possible. You can see that chip up there in the bottom half of that very first picture if you're so inclined. 2) Use the B6 in the living room but choose a darker/more saturated version for the brighter rooms. Do something in the kitchen. I don't even know. The B6? The yellow? 3) Use the B6 everywhere and stop trolling Pinterest non-stop from the hours of 10 p.m. until 2 a.m.
4) Some other option which you will fill in right there in that pretty little combox. Speak my design savvy friends. Speak! p.s. Would you like an actual tour of the terrible kitchen complete with ranting commentary on the foolishness of the miniature BROKEN dishwasher? would that be fun for you? 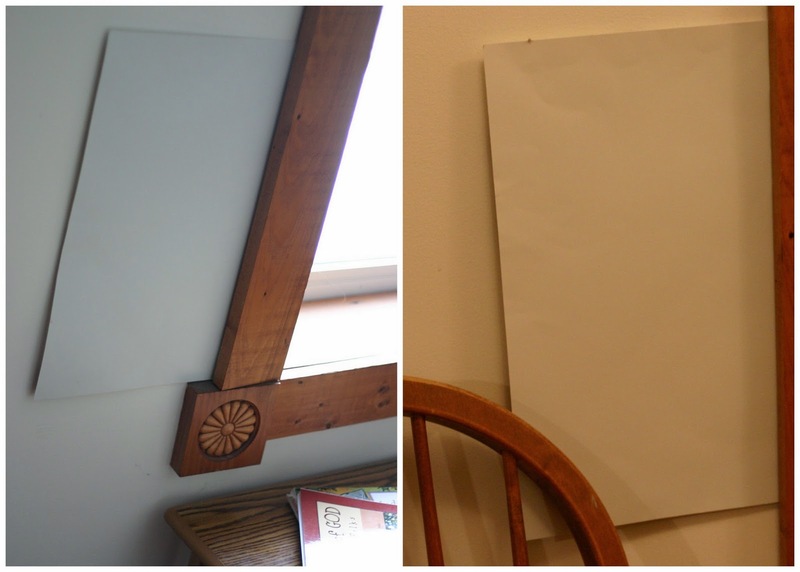 My designer hubs says no glossy or satin paint in older homes (like ours)....they tend to show every flaw in the wall! I really love color too, but I tend to incorporate it in accessories, plants and art rather than wall colors. If it were my house, I would do a very light neutral (I used BM's Moonshine and White Dove in my house). really though, it's just paint. It isn't permanent and you can change it up as much as you want. For sure I need to do that! How have I not thought of that already??? Whoa. So out of it. Yes to the ranting kitchen tour! This post spoke to my heart because we have been in our house for a year and have slowly been repainting all the main living areas. 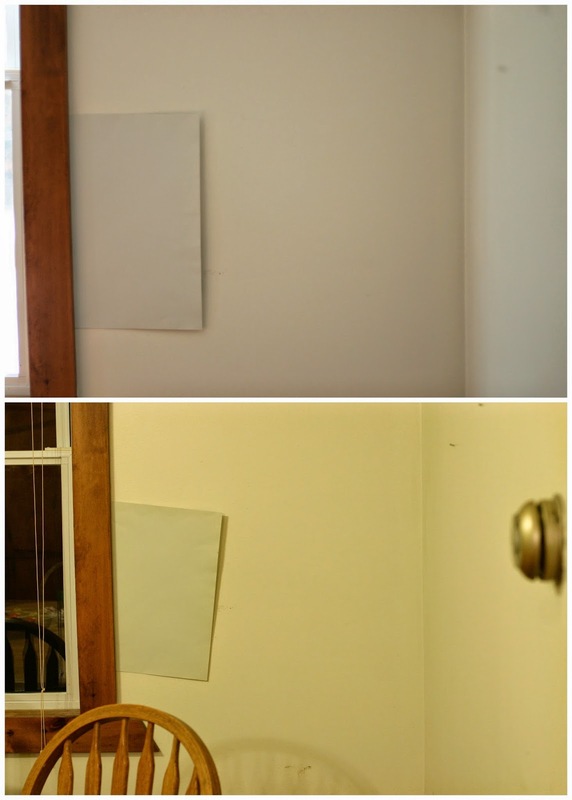 #1 - get some sample paints and start painting swatches on walls. Paint them in the same color order everywhere and see how they sit with you for a few days. 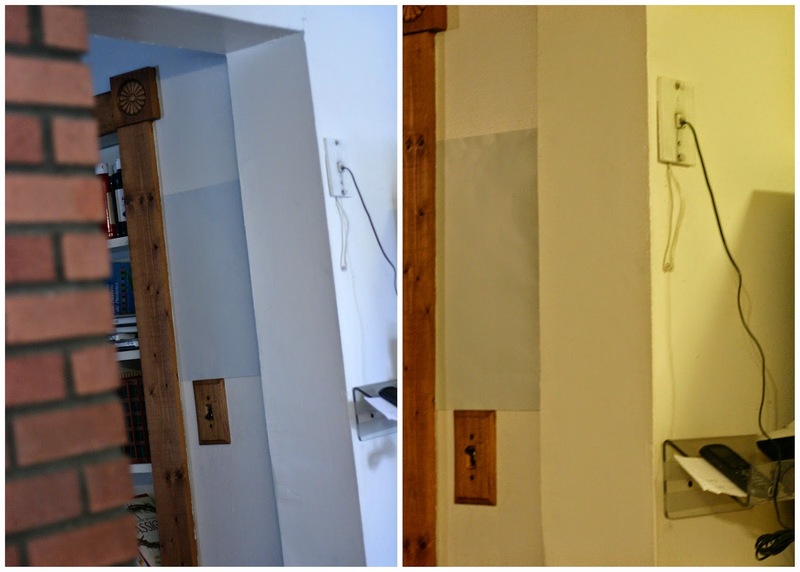 Swatch every wall so you can see how different light plays with each color. You'll be surpassed how different color looks on a wall at different times of day and there's nothing like letting it seep into your brain over a few days. #2 - Benjamin Moore Moonshine is an AMAZING color. Definitely worth a few test swatches. Lowe's can match any BM color for samples if you are interested. You don't have to go to a BM store. #3 - I just repainted my bathroom with Valspar Bay Waves which is a gorgeous cool grey, and my guest bedroom with Moonshine and I am loving both of them. Also worth considering is the BM Gray Owl color. Bay Waves is a more saturated version of Moonshine I'd say but amazingly in my small hall bathroom without a window, it doesn't read as dark, just as am awesome backdrop to my white cabinet. But seriously ... paint some sample swatches. It's the best way to get a feel for what works for you. 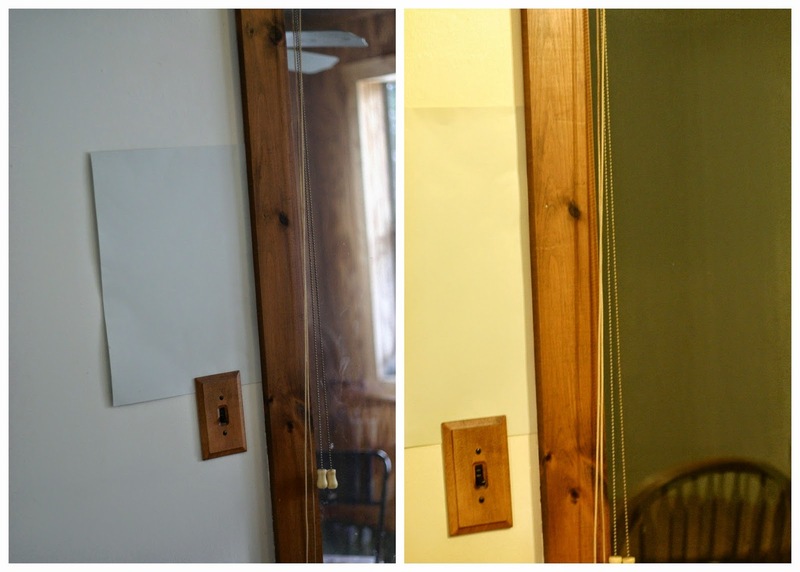 I'd go with all one color - we just did that in the house we bought this summer, and the clean slate is wonderful - but maybe trial the gray in a small area. We're just a little north of you, also in the Lakeshore snow belt, and I've come to appreciate lighter creams with yellow undertones. I don't think that's what the cool kids are into now, but I lived one too many winters with a paint color that felt like living inside a cloud! I loved the gray in a bedroom, though. Looking forward to seeing what you choose! My two cents... Benjamin Moore Revere Pewter. Take your time and do your swatches, because it looks so different in your house/lighting conditions between day and night time. Good luck, can't wait to see what you decide to do! My opinion. .flat paint is from the devil in a house with a bunch of kids. We moved into a brand new house with flat paint, within a week had little scuff and fingerprints everywhere that are not at all scrubbable! Eggshell at the least. . I totally agree! Eggshell on all room except the kitchen and bath. Satin in those for easy food and poop removal. Satin + magic eraser can stand the test of many small people. Agreed! Flat paint requires painting over stains. Ain't nobody got time for dat! Egg shell for sure!!! 10 kiddos here and flat is a nightmare! Can I throw one more color into the ring? Sherwin Williams Silverpointe, it's my fave! I vote red. RED EVERYTHING. Red rooms are my favorite, too! I think all one color throughout the main living areas would bring everything together and make it more cohesive and sensible and bright. Definitely a win there! I do like the color, the nighttime pics make it look a bit bland, but that could be camera vs true nighttime color, kwim? That Benjamin Moore color is to-die-for so even though I think the original color is good I think with that much space I'd opt for the Benjamin Moore color just to be safe. One little tip: I stock design blogs and just pick their paint colors ;) Especially for the oh-so-elusive perfect-neutral color! Rooms I'm more ambitious and random with, but the main living areas I DO NOT want to have to repaint so I think long and hard about those. Also, I agree with Eggshell paint. We also have bad luck with flat paint and kids. But obviously others are too shiny and show imperfections. Eggshell is the perfect in-between that we use everywhere but the bathrooms. In the bathrooms we use Satin but i might not if our house had plaster walls, if so I might do eggshell in there too. Annnnd for specific colors, I just learned from reading this post that I could talk about paint colors for hours...but read about them for approximately 30 seconds. BUT have you thought about making an overall palette for your main living areas? Not as scary as it sounds. All the same color tends to be boring in a bigger house. Like it was staged for sale rather than a reflection if who lives there. Especially when done with all neutrals. Our whole house was beige when we moved in. Yuck. Downstairs is still beige. But I'm planning on a yellowish-cream for the living room and dining room (the living room not much yellow, more formal room), and a buttery-yellow for the kitchen. It's a small house and the light is primarily from the west in the kitchen, and from the east in the dining room. The living room is south/east but dark because of the trees and big front porch. Kitchens in general are freer for paint colors because so much is taken up with cabinetry anyway. And my house is small with an open-ish floor plan so I couldn't go too vibrant. Or jump too much around the color wheel. Hopefully this helps you some. I think you could have fun with your colors and still have it flow. And the red couch keeps things from being boring. But I'm shocked at your choice of "greige". You don't seem like a grayish-beige person whatsoever! Live in Scandinavia, with maximum winter dreariness. I find that darker colors look really gloomy in the winter. The longer I live here the more I become committed to white. White walls, white trim, and lots of color and visual interest in pictures and decorations. But ymmv. Seconding everyone who says no to flat paint. Red goes with almost anything. I've got lots of red accents, and my kitchen is kind of a strong aqua color, and my living room is a green that goes with both the kitchen blue and the red accents... What I'm saying is, if you like color, pick a color. A real color. 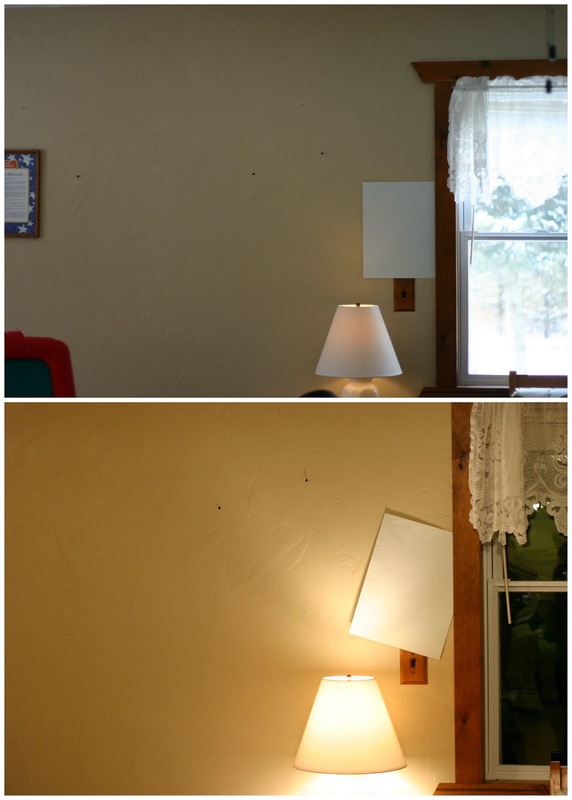 But go to the paint store and bring home a hundred likelies, tape them to the wall in question, and rip 'em down throughout a week as the light changes. But the fact that you are asking us for advice tells me your current choice is a no go. Good point! If I loved it I wouldn't be aaaaaaaaaaaaasking. Vive US rhe kitchen tour!!! Okay, so it looks like your issue might be the lighting and not the paint color. I think the colors are beautiful in the daylight! And that blue gray with the fireplace and the trim! Ah, I love it. Your lighting is really yellow, though. Any chance you could upgrade the bulbs to a more natural light look? I hate artificial light for this reason...everything looks yellow. But there should be better (read: more expensive) bulbs out there that would make a big difference. As long as they're not the dreaded mercury CFI things. If you can't I wouldn't worry too much about the evening light because that's just how it is in the evening. It would be really hard to find something that looks great in yellow light that is also going to look great in the daylight when it's more important (to me). Okay, that is an excellent point. Especially in the dark, small living room I don't want to go too dark. Everywhere else maybe something *more* but in there, this is probably on the right track. Better bulbs. I can't believe I haven't thought of that until now! I like the yellow light ... it reminds me of candle light, or fire light. It's cozy. Um, you lost me at ... the second photo! I'm just saying that to point out how awesome you REALLY are and that I'm sure that you're going to make a great choice. Yes to the kitchen tour! I want to compare it to the kitchen in our last house, which had fake brick wallpaper and a dual goose-neck desk lamp-type fixture above the kitchen sink. It was special. Have you committed to a countertop? When we priced ours out and saw the difference between Costco granite and laminate from wherever, we went with the Granite. it was $50 square foot and will last and be beautiful forever. Also, it took us 3.5 yrs to see the solution to our layout problems. I hope you have your aha moments before you get started. I can't say how much I love our new kitchen and living room after painting in sherwin Williams aloof gray. In the natural light it comes off slightly blue, which I didn't mind at all bc it wasstill so pretty, and in the shadows it's a true gray. Goes lovely with our white trim and white linen (ikea, mucho cheap but oh so pretty) curtains. We hit a sale at $27 a gallon and only used 2.5 gallons for the whole 2 rooms. Decisions! But they're fun decisions. I will just be honest and say I do not like that color. I think it's alright in good natural light but it looks boring and nondescript yuck in artificial light. The suggestions to try different light bulbs might be worth a try if you looooved the paint color but do you really have time for that? And time to always remember to only get a certain type of bulb so your paint doesn't look like crap? If you are a color person, go with color. More color than that. That color says you're a neutral person, and if you paint it all over your downstairs I'd think you were scared of colors and unsure of yourself with decorating, which probably isn't what you want folks to think. Painting the whole floor of your house all the same color says one of two things to me 1) you were trying to make it neutrally appealing so you could sell it 2) you were uncertain and afraid and you thought the same neutral everywhere would save you from hard decisions. In my old house I had a soft pale green living room, a buttery warm yellow dining room, the kitchen was a shade darker than the lving room, all with crispy white trim. I loved it. At my new place the former owner was really into DARK colors, like deep dingy tealish color in the living room, mauve in the sunroom (???? ), terra cotta and mustard master bedroom. Agh. The deep satruations of ugly colors are making me yearn to just paint everything white. I think I'm going to go with almost whites instead, but the only room I've committed on so far is the kitchen which is going from medium ghastly blue to palest warm peach, and I snuck some out of that can for the bathroom too. I think if you are not sure, you need to get more swatches. Lots of swatches. Don't just surf Pinterst for examples of the colors you think you want, either. You might find a color you never thought of that you love if you branch out more. You're going to be painting in chaos with all those sweet kids...so make sure you love it and you're sure before you dive in. Oh, and don't use flat for the love of all that's holy...don't use flat. Amen to the 'no flat' comments. 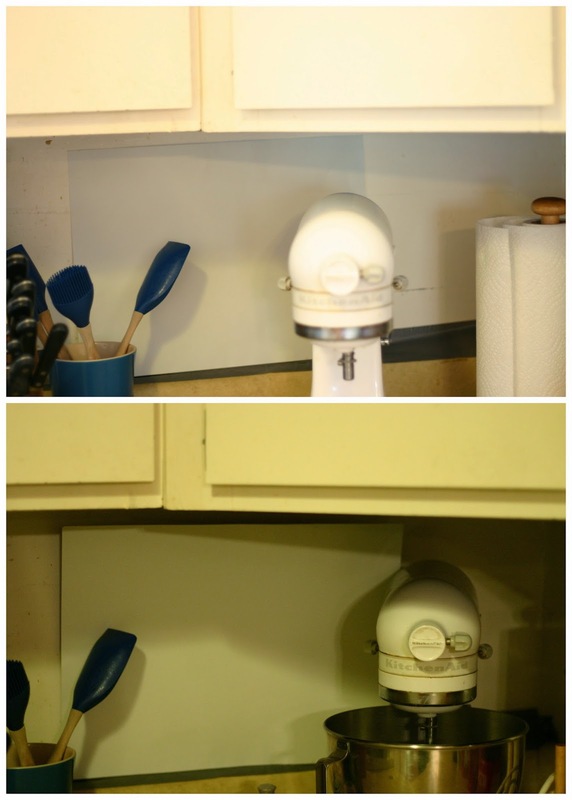 Eggshell is easy to scrub and doesn't shine. Promise. Although I do think each brand is a bit different. Honestly, I'd have to walk through the house to get a feel for the rooms to make color choices, but when I did my house (all at once), I chose a palette that looked good together, but still gave 'colors.' 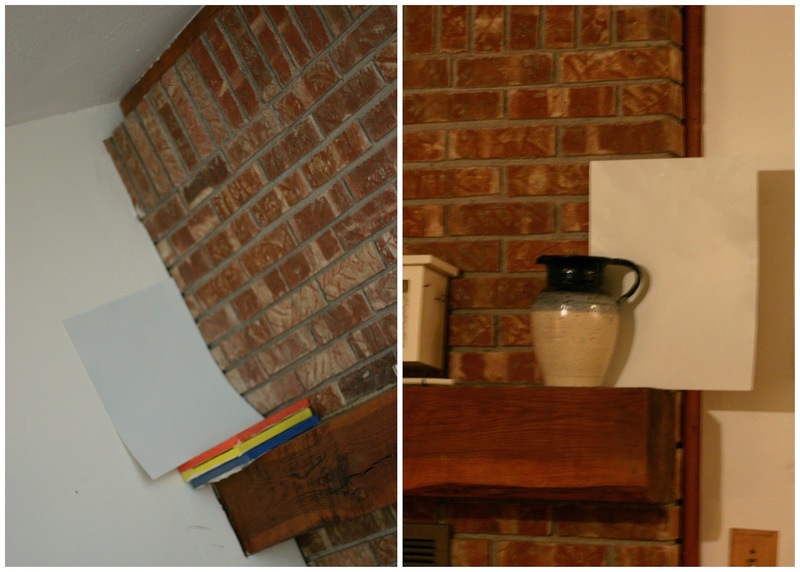 In the main rooms, hallways, and connected rooms I did a buttery yellow, and in separate rooms a terra cotta, a khaki, and brick red that all had similar undertones (tape the swatches all together to see if they look cohesive) to tie everything together. In rooms that were not part of the main 'flow' (master bedroom, etc.) I did even bolder colors for fun. My bedroom is a dark peacock blue, and it's gorgeous. I let the kids pick their own colors, so that was interesting. I only did white or near white in small rooms where I felt I had no choice. You just seem like such a bright, fun person, that I could totally see you going with fun colors. Paint all the woodwork white, and go with citrus colors, for example. Especially if the house doesn't have award-winning mahogany that it would be a sin to paint over. 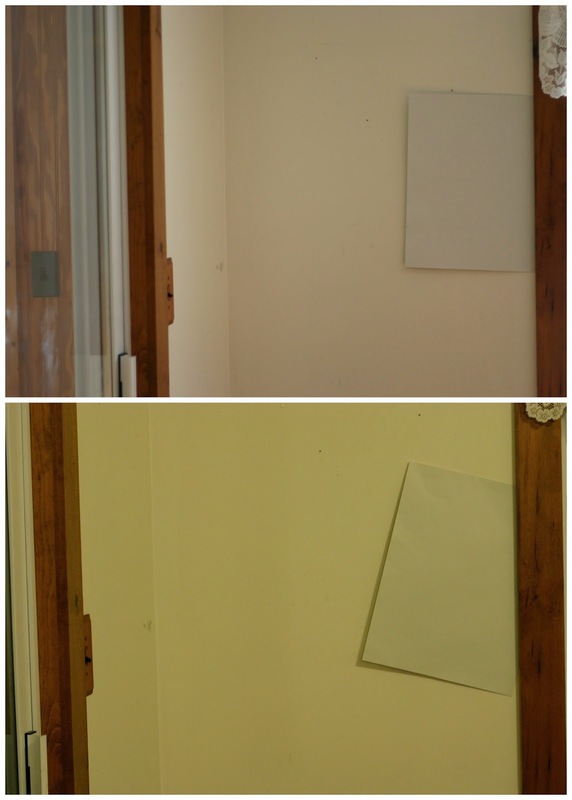 I think of myself as an artistic color-lover, but I usually go white with walls (not a bright white, but creamy). I don't want to have to think about my furniture or accessories or curtains clashing or competing with the walls. The walls are the backdrop to everything else. I'm the kind of person that it would really bug if I had to look daily at a painting I hung up against a wall that clashed with its colors. I pick things out to decorate my house that I like, not because they "go" with my color or decor theme. Colorful icons and traditional religious art look great against white walls. I'm totally into the Carl Laarson look so if I had the time and was as artistic as he was, I would paint designs all over the walls. So, I'd say paint the main living areas a creamy white or very light, light yellow or linen. Save colors for the bedrooms and bathrooms. (My daughter has a teal bedroom, but she's probably going to be the next Martha Stewart sans jail time). I have the worst time picking paint colors, too. It seems whenever I pick "color", its always off once its on the wall. To prep the old house for moving, we used BM Barely Beige, and I loved it so much that I'm using it in the new house as well. At least the family room. I like color, too, but IMHO, I think it might be a good idea to keep the walls quiet, and use things like, oh, large red sofas, to bring color into the room. I find books strewn across the floor, toys all over the couch, and yogurt on the walls also helps bring "color", "life" and "texture" into a "space." We like grey over here but a grey shade of white (We did wind fresh white from SW). Moonshine is what I would call a committed grey. Kyle wishes we had done that! Might be too much for the entire house though. I say go with a white that's either more warm or cool depending on what you like so that it provides a bit of contrast to the bright white trim but doesn't compete with your furniture and paintings for attention.